Birds and beer have nothing in common that I can think of, but both are included in this post. The hummingbirds have been at war for the last several weeks. Every time one comes to feed, another one attacks. We have two feeders, one near the back porch and one on the side deck. We watch one feeder while we are eating, and I look at the other when I intend to write. This morning I was watering plants when a hummer hovered there, only 12 inches from my shoulder. I froze as he hummed for his liquid breakfast. What a privilege it was to share space with him! This afternoon I happened to see a tiny bit of peaceful coexistence. Two birds drank at the same time. They were nervous about it and soon rose in the air to have a whirling battle as graceful as any ballet duet. The demented cardinal quit attacking the sliding glass doors after grandson Nathaniel washed them. I was reading the newspaper on the front porch this morning when I heard a whir and a bump. That silly bird flew onto the porch, landed on the floor, hurled himself at the glass beside the front door, bounced off, and flitted away. He must have done it four or five times while I was there. I think I saw two hawks on a wire over the road while on my morning walk. The fog was so heavy that I didn’t see them at first. I stopped and reached for the toy camera, but they were gone in a flash. The birds were definitely larger than doves, and I had the impression of roundness about the heads. There was not enough light to see any color. As they flew, I noted big wings and squared tails. 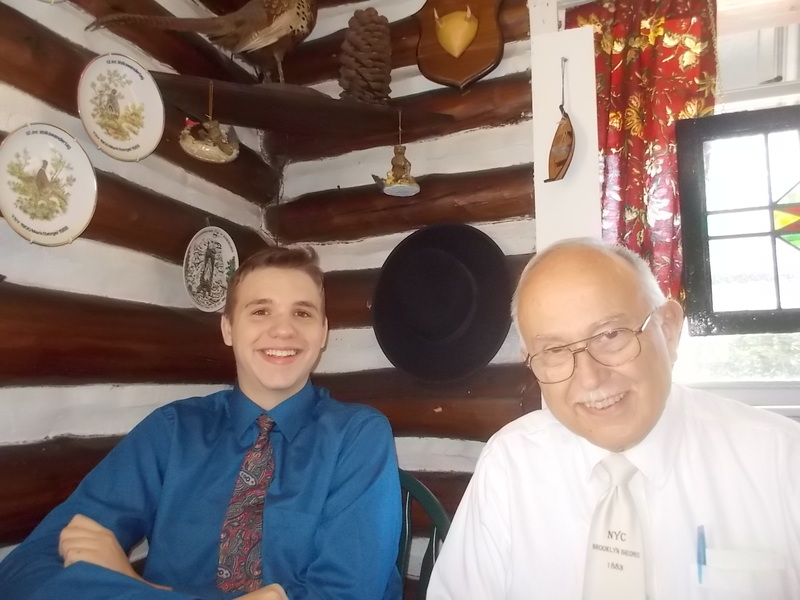 Our son heard about a good German restaurant north of Asheville that sparked Nathaniel’s interest. Unfortunately, son $ had to cancel today, but we went on without him. I discovered the name of the place was more specific – Bavarian Restaurant and Beer Garden. What a delight! Nathaniel chose Blauer Engel Schnitzel; John had Münchner Sauerbraten, and I had goulash. As you might guess, I copied the first two names from the on-line menu, because I couldn’t spell them. [Sorry for the caps. The paragraph looks OK in the draft.] We shared two desserts. 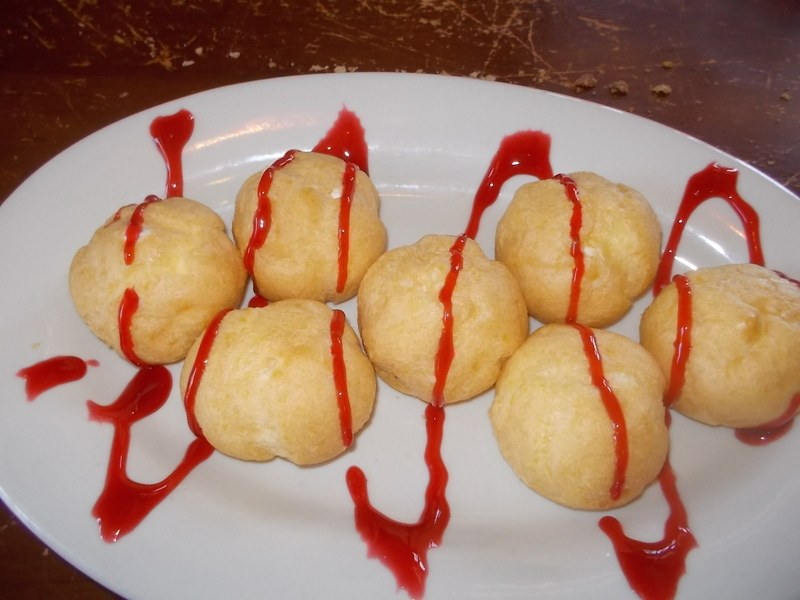 We had Bavarian cream puffs and a fancy concoction in a wine glass. 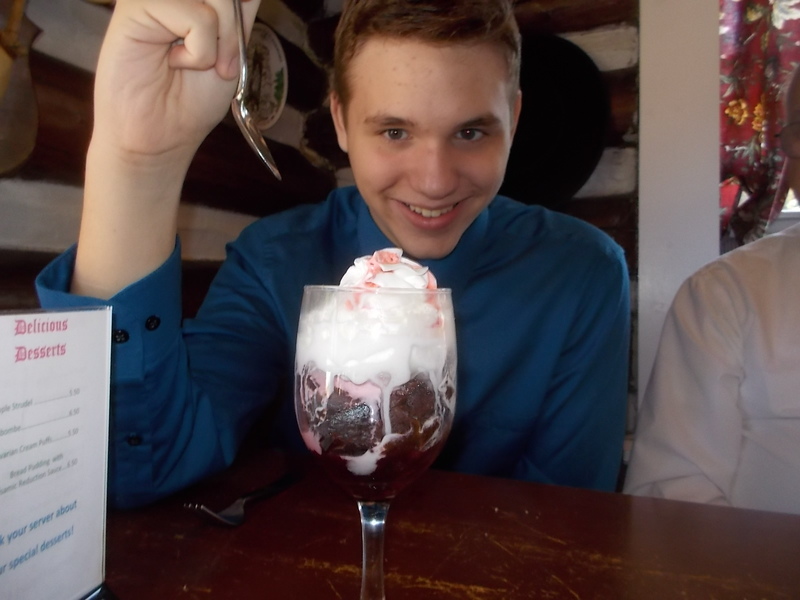 There was Black Forest cake in the bottom, topped with cherry ice cream, hot fudge sauce, and whipped cream. We felt sanctimonious stopping at Owl, the produce store, to buy vegetables and fruits on the way home.